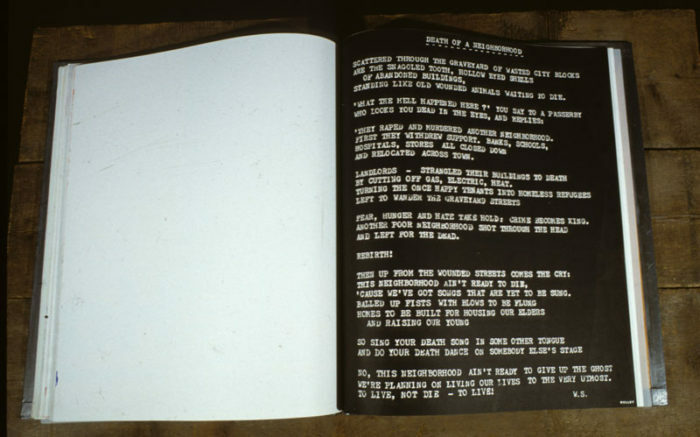 Andrew Castrucci and Nadia Coen, eds., “Your House Is Mine,” 1992, 33 signed silkscreen prints on Mohawk vellum paper, and additional offset pages, bound with wood and metal, 21″ x 24″, edition of 150. 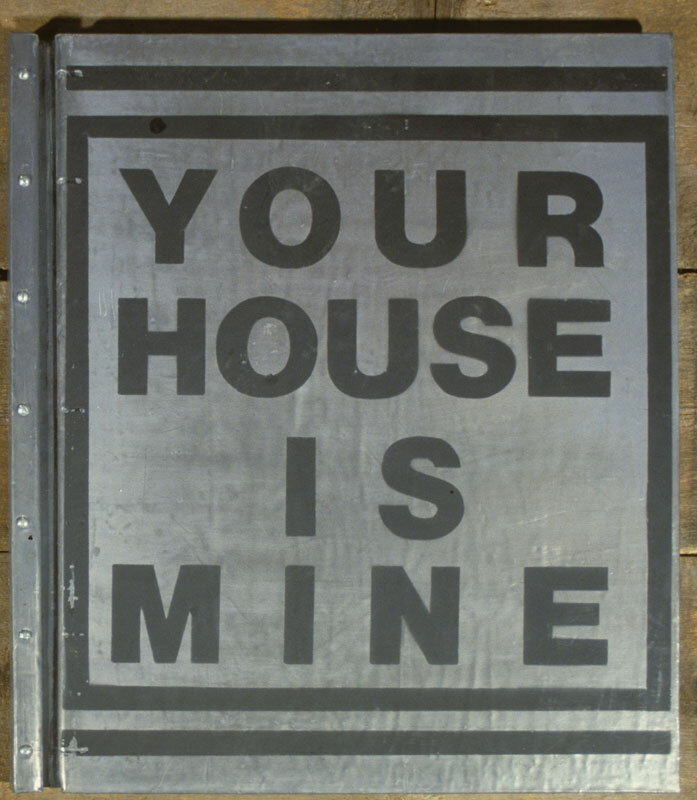 Andrew and Paul Castrucci, with Nadia Coen, began collecting the posters for the book and street project “Your House Is Mine” in late 1988 as a response to the riots that broke out that summer in Tompkins Square Park. 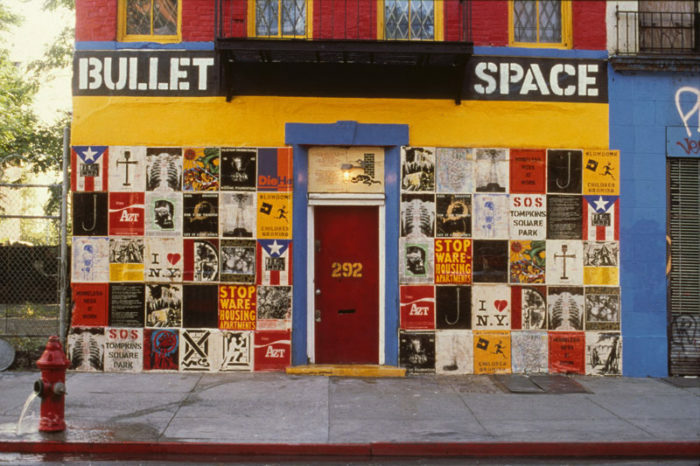 The selected artists (including David Wojnarowicz, Martin Wong, Sandra “Lady Pink” Fabara, and Lee Quiñones) worked directly with Andrew Castrucci to make silkscreens of their images—first at the Lower East Side Print Shop, and later (once Bullet Space had running water) at the new Bullet Print Shop. 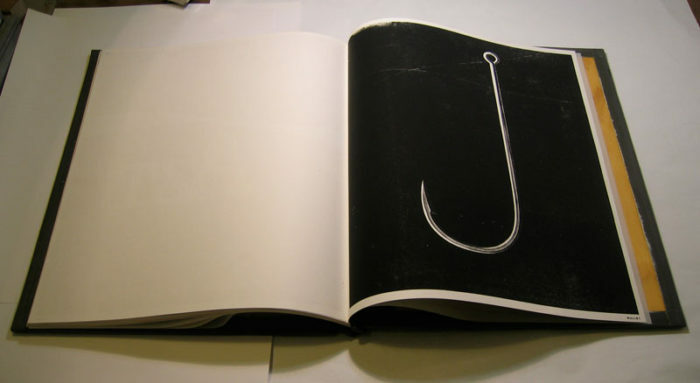 From each silkscreen, 150 prints were made on thin paper to be wheatpasted onto outside walls, and 150 on 50-pound archival paper to be bound into books. 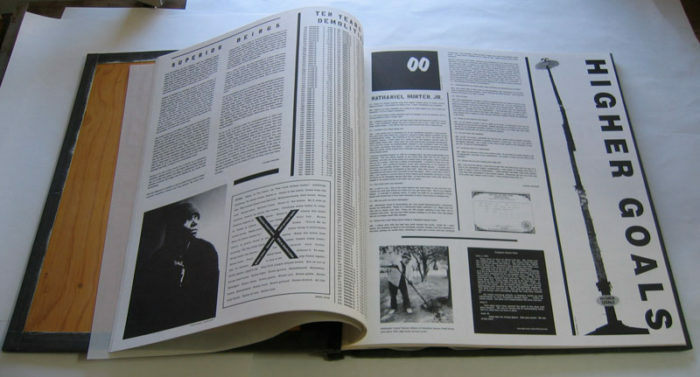 Andrew Castrucci and Nadia Coen designed the oversized books, each of which includes (in addition to the 33 silkscreen prints) additional offset pages with written contributions from such figures as Miguel Algarín, Chris Burden, Martha Cooper, Daze, John Farris, Alan Ginsberg, David Hammons, Hettie Jones, Cookie Mueller, Public Enemy, Adam Purple, Bimbo Rivas, and Andres Serrano. The epitome of Lower East Side art, Your House Is Mine has been acquired by the Metropolitan Museum, Museum of Modern Art, Whitney Museum, Getty Museum, Walker Arts Center, Victoria and Albert Library, New York Public Library, Beinecke Library at Yale University, Fogg Museum at Harvard University, Brooklyn Museum, Stadtmuseum Berlin, Stedelijk Museum in Amsterdam, and other collections. Your House Is Mine street poster exhibition wheatpasted on Bullet Space exterior.